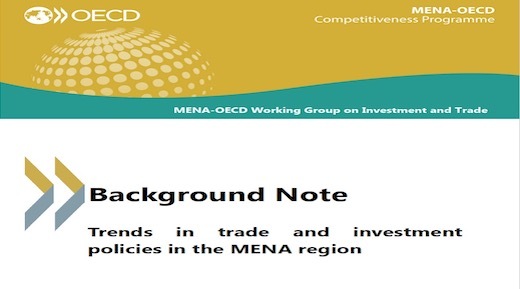 A policy brief titled “Trends in trade and investment policies in the MENA region” was prepared by Nasser Saidi & Associates to aid discussions during this meeting. The executive summary is shared below; the paper can be downloaded here. The Middle East and North Africa (MENA) region accounted for only 5% of global exports and 4.3% of total imports in 2017. Merchandise exports from the MENA region to the rest of the world stood at 893bn USD in 2017 (up from just under 250bn USD at the start of this century). MENA countries are particularly vulnerable to terms-of-trade shocks because of the volatility of their export earnings, caused by the high concentration of exports in primary commodities and exacerbated by the high concentration of export markets. The region can achieve greater economies of scale if each country can better use its comparative advantage through production sharing networks and integration into global value chains. There has been a significant shift in the region’s trade patterns toward Asia over the past few decades. Asia now accounts for about 55% of the region’s total trade compared to around 40% in 1999. Regional trade remains dismal at under 10%. MENA oil importers’ share of trade within the region remains relatively high: Lebanon (44% of total exports in 2017) Jordan (43%), and Egypt (22%). Maghreb countries export the least within the region (under 10%), with much of their exports going to Europe. FDI inflows into the region increased between 2000 and 2008, thanks to efforts to improve the business environment and investment climate and to related structural and institutional reforms. Slowdown appeared after the financial crisis in 2008 followed by regional turbulences, with limited recovery. In 2017, investment flows into the GCC were 15.5bn USD, almost 3.5 times lower than in 2008 at their peak. The bulk of FDI inflows into the region have gone into energy, real estate, financial services and consumer products. The scarcity of quality data and statistics on both domestic and foreign investment means a lack of evidence-based public policy and increases perceived investment risk. Ensure the availability, harmonisation and dissemination of regular, timely, comparable and quality statistics, which are essential to conduct sound trade and investment policies.